Railpictures.ca - Bill Thomson Photo: Amtrak B32-8WH 517 heads up today’s “International”, stopped at the station in Sarnia before entering the St. Clair tunnel and continuing on to the USA. The GE B32-8WH (or Dash 8-32BWH) was an Amtrak-only model variant of GE’s B32-8, equipped with a widecab and HEP output for passenger service. 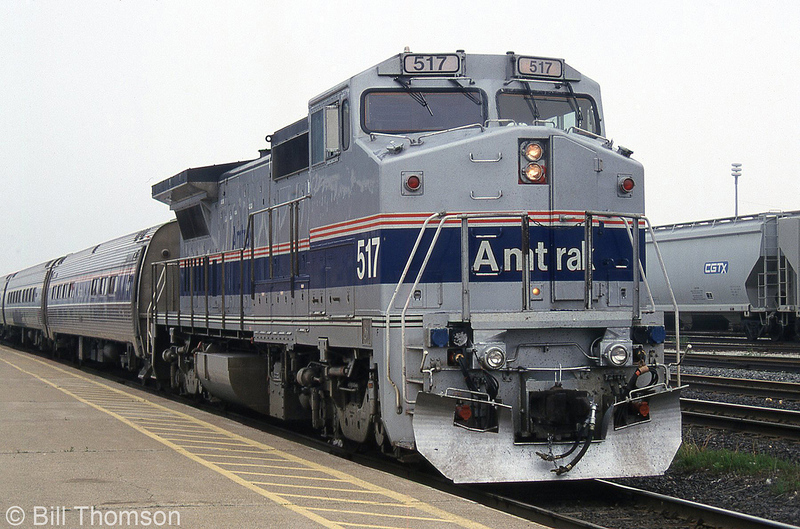 Only 20 were built for Amtrak in 1991. | Railpictures.ca – Canadian Railway Photography – photographie ferroviaire Canadienne. Caption: Amtrak B32-8WH 517 heads up today's "International", stopped at the station in Sarnia before entering the St. Clair tunnel and continuing on to the USA. The GE B32-8WH (or Dash 8-32BWH) was an Amtrak-only model variant of GE's B32-8, equipped with a widecab and HEP output for passenger service. Only 20 were built for Amtrak in 1991. A great photo! Too bad we lost that train.